Whether you are into the shabby chic couture or inspired by Asian décor, speckled bamboo poles bring a style of decorating that balances modern and old world charm. The colors range from dark brown base to light tan and brown spots. 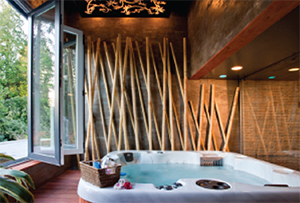 Moreover, speckled bamboo poles characterize the virtues of strength and endurance. Please note all sizes are approximate. Speckled bamboo poles are lightweight while still maintaining the durability needed to be used indoors and out. They essentially are natural bamboo poles that contain specks surrounding the nodes. Like black bamboo poles, they can easily tie into your existing decor. The poles combine antique designs with a modern flare together seamlessly. Coloring can range from a dark brown base with light tan to brown spots. Speckled bamboo poles can be used in a wide variety of projects inside and outside of the home as well. Speckled bamboo poles are treated to withstand insects, mold and weathering which makes them great for using in outdoor projects. For outdoor use, some common ways to use bamboo poles are to create privacy fences, pond surroundings, garden edging, gazebos, deck siding, bar tops and bar siding and some other unique garden DIY art pieces. For indoor use, speckled bamboo poles can commonly be seen in art pieces and mirror framing and for other décor such as simply placing some poles in a large vase. When you choose to use bamboo for using inside and outside of the home, you are choosing an environmentally friendly product. Bamboo is extremely sustainable compared to other common wooden building materials. It has an exceptionally rapid growth rate and is very easy to transport compared to heavy hardwoods. There are also fewer chemicals involved when it comes to extracting and treating bamboo materials compared to other traditional building materials. Speckled bamboo poles are the true symbol of strength and endurance. 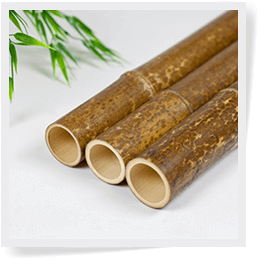 Speckled bamboo poles are available in the following sizes: 3ft., 4ft., 5ft., and 8ft. Whether your style is shabby chic or classic Asian, speckled bamboo poles can be the missing piece to your home decor puzzle. Order today to receive commercial grade products with free shipping while it lasts.